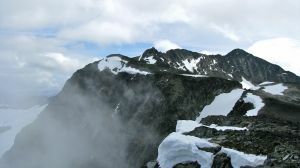 A rounded, rubbly peak in northern Garibaldi Provincial Park, located on the northeast side of Wedgemount Lake, and on the northwest side of the Armchair Glacier. The mountain is composed of generally poor rock of varying degrees of looseness. It's easiest peak to climb around Wedgemount Lake although it sees relatively little traffic. Access is from the Wedgemount Lake hut. From the hut, scramble up to the west ridge and follow it to the summit.